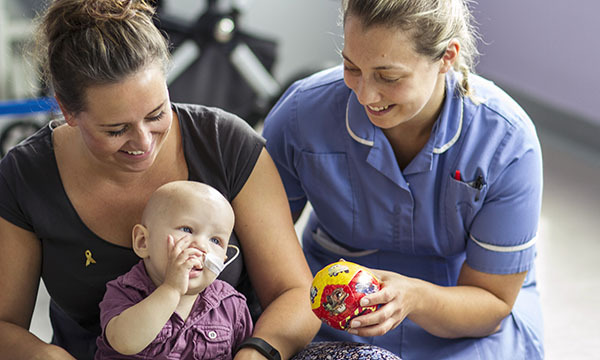 Specialist nurses provide a crucial service to children with cancer, often acting as the key worker and coordinator of care, and having a long-term relationship with both the child and their family. But what challenges do they face and how can they be supported to deliver the highest quality care to children – often from the point of diagnosis until they transition into adult services or, sadly, die? A round table convened by the charity Solving Kids’ Cancer brought together paediatric cancer nurses from different centres to discuss these questions. Those on the panel highlighted the strong relationships they formed with families. ‘I believe it is the right thing for a family to have someone who walks the journey from start to finish with them,’ says Bristol Royal Infirmary neuro-oncology clinical nurse specialist (CNS) Rachel Perrow. But they also acknowledged the challenges they face in delivering this level of care and support. Top of the list for many was workload, with caseloads rising, often linked to improved survival rates – one estimate was that they had moved from one nurse to 40 patients a few years ago to one nurse per 60 now. 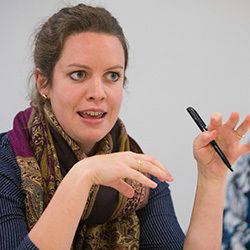 ‘We are pulled in all directions,’ says Alice Howard, a CNS in Southampton, who said CNSs were stretched so much that sometimes they could not attend multidisciplinary team meetings or clinics. With everything from newly diagnosed patients to those receiving palliative care, a CNS had to manage conflicting demands on their time. ‘I have to make judgement calls – where is the priority?’ said Ms Perrow. The ‘shared care’ model used in many areas also means a CNS based at a cancer centre will be covering a large geographical area and liaising with other hospitals where children may be receiving part of their treatment. For some, this can mean a long time on the road. ‘Sometimes you can be four hours in the car just to go to a multidisciplinary team meeting,’ said Ms Howard. What would make things easier? In Bristol, a Macmillan-funded support worker has taken some of the pressure off CNSs, enabling them to spend more time in direct patient care. Time and workload. As survival rates have improved for many cancers, clinical nurse specialists (CNSs) are finding they have larger caseloads, including patients who are in remission but need monitoring for many years. This can create time pressures for nurses, especially if they don’t have adequate support. IT when working across hospitals. Hospitals’ IT systems are often not interoperable, making it hard for everyone involved in a patient’s care to have access to the same information. In some cases, discharge letters are still sent by post to GPs. Generalist or specialist? Many CNSs in paediatric cancer have to cover a wide range of cancers because the number of patients with each cancer is small. With small teams there can be challenges when a CNS is on annual leave and colleagues have to cover. Such posts are often funded for an initial period and departments then have to put forward a business case to their own organisation for them to continue. Having tools to measure workload and being able to demonstrate the impact of extra support is vital. How far should a CNS specialise? But with small numbers of paediatric CNSs in many centres, dealing with annual leave and other absences can be difficult. CNSs sometimes have to cross-cover in different cancer areas – for example, a CNS who specialises in solid tumours may need to cover for someone in blood cancers. This exposes an underlying tension around how far CNSs should specialise. ‘There is a challenge in maintaining a high level of knowledge in all of these tumour groups and all of the trials,’ says Helen Morris, a matron at Bristol Royal Infirmary who is the lead nurse in south west England for paediatric oncology. With rarer cancers, it would not be feasible to have many specialist CNSs and they would probably have to be regional, making it difficult to provide direct care. But could they provide a repository of specialist knowledge that would support other CNSs and healthcare professionals? 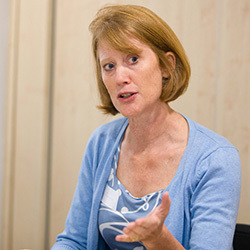 University of Surrey professor of child health and cancer Faith Gibson says that sometimes having a ‘specialist’ available could lead to everything involving the cancer being seen as ‘their’ job rather than being part of everyone’s. ‘But we know that in the past we have had these national roles and they do work,’ she says. In time, posts initially funded by charities could be taken on by the NHS – as has happened with Roald Dahl nurses for children without a diagnosis. Some paediatric cancers were ‘high-cost low-volume’ diseases that added to the challenge, she said. The small number of CNSs also means that training courses can be hard to find – universities won’t put on courses if there are too few applicants. Julia Egan, a professional adviser to the Scottish Government’s chief nursing officer, said in Scotland there was progress on collaboration between education providers to ensure viable courses could be put on. Some areas have developed advanced paediatric nurse practitioners who look after patients in oncology day beds and have enhanced skills around differential diagnosis. This is partly a response to junior doctors’ rota shortages but can also offer a progression route for CNSs, although some feel it is a less holistic role. Improved IT systems would also benefit CNSs who work closely with other hospitals. Often sharing and accessing information is made more difficult by systems that are incompatible, and any sharing has to be compliant with data protection laws. This can mean CNSs spend time accessing and sharing data when they could be working clinically. Solving Kids’ Cancer chief executive Stephen Richards stressed that the charity wants to help CNSs overcome the challenges that get in the way of service delivery and their professional development, and will work with them to develop ideas on how this can be done. Around 90-100 children are diagnosed with neuroblastoma in the UK each year, with 90% of them under the age of five and an average age at diagnosis of 19 months. It is hard to diagnose, being both rare and presenting with a wide range of symptoms, and in the majority of cases the cancer will have spread by the time of diagnosis. Only 68% of children will survive for five years. Half of neuroblastoma cases are classified as high risk, and treatment is initiated immediately. This can be intensive and parents may end up spending months in hospital with their child. About a fifth of high risk cases will not respond to initial treatment and many others will relapse. The presence of the MYCN oncogene, found in around 20% of cases, is associated with a poor prognosis. Children who relapse are likely to be enrolled onto a clinical trial but some parents will seek innovative treatments abroad, often crowdfunded. Those who survive often have effects from the intensive treatment that can last into adulthood. Solving Kids’ Cancer supports families of children with neuroblastoma, including providing advice about fundraising to enter clinical trials abroad, and also funds research.